Anyone with a permanent setup, particularly those set up remotely, may wish to be able to seal their telescopes at the click of a button. With remote setups, this is particularly essential to keep out dust and insects from migrating into the telescope. There are a few options available for motorised telescope covers. One is the Gemini Telescopes SnapCap. I had this one for my Takahashi FSQ-85ED but unfortunately I found several disadvantages with it. For starters, wiring it up was fairly convoluted for what should be an easy-to-setup addon for a telescope. The SnapCap required I take the output cable of a typical 12 V power supply (one used for a mount, for example), snip the cable and solder two cables to it (like a Y-splitter). One of these cables went directly into the little box for the SnapCap, in the input that provided constant power to the SnapCap motor. The other cable went through my Dragonfly power relay switch and then to the little box for the SnapCap, in the input that defined the open and close of the cap. The Dragonfly then allowed me to control the open and close of the cap by providing a current through this second cable, or stopping the current. Certainly not an impossible task to wire up the SnapCap, but why the need for so much hassle when the motor consumes so little current? The design certainly did not seem like the most efficient it could have been. 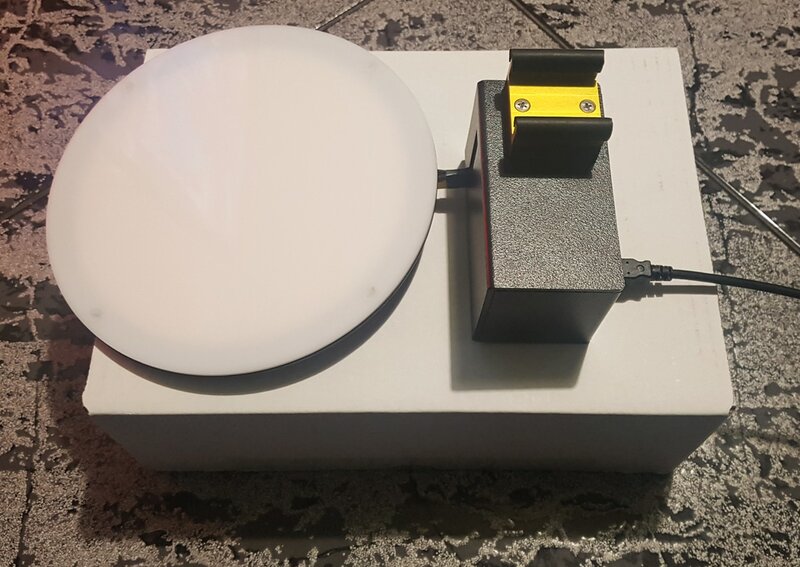 All the SnapCap really needed was a single USB connector to power the motor and for someone at Gemini Telescopes to use the ASCOM platform to develop a simple program to interface with the SnapCap. The second disadvantage was what led me to eventually replace the SnapCap altogether. The little box with the two inputs had almost no tension holding the two connectors in the inputs, meaning I had to keep it all in place with a strongly-bound cable tie. I am pretty sure that this tension over the course of months is what led to the eventual electrical contact faults developing inside the little box. My SnapCap started behaving erratically - not opening at all or closing when it should stay open. Since the default state of the SnapCap is to close (when you do not provide a current through the second input in the little box), it tended to stay closed or simply close when open. 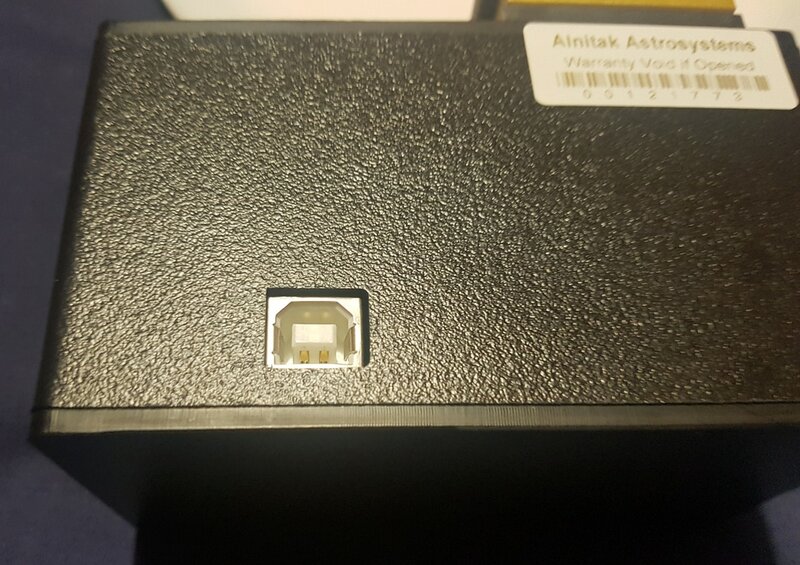 On visiting my observatory, I realised what was happening - an electrical contact fault developed inside the little box that meant that wiggling the cable around, with or without the cable tie, would lead to there being a current and then the current cutting off suddenly. Obviously this was in no state to be used on a remote setup, so I disassembled everything and removed it entirely. Enter the more expensive but better option for motorised telescope cover - the Optec Alnitak Flip-Flat. My previous SnapCap was simply a dust cover, which I opted over the version with the integrated flat field panel due to the fact that I already had an Aurora Flat Field Panel set up on my pier. Given that I now had to change the motorised telescope cover, I thought I would go the whole way and get myself the one with the integrated flat field panel, simplifying my setup even further (as I could then remove the Aurora Flat Field Panel entirely). For simpler setups, they also make the Optec Alnitak Remote Dust Cover, which is the same but without the integrated flat field panel. 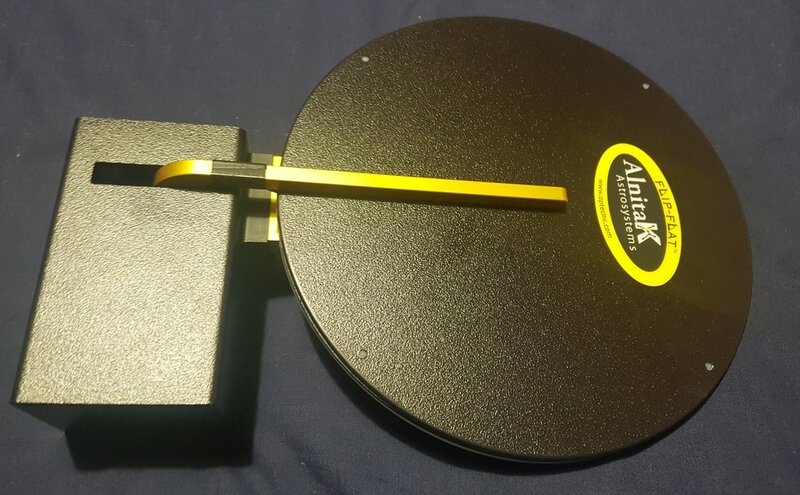 ​The Alnitak Flip-Flat box comes with the Alnitak Flip-Flat itself (this one is the 100-150mm​), a 12 ft (about 3.66 m) USB cable, two plastic cable ties to attach the Alnitak Flip-Flat to the telescope aperture, the drivers and manual CD (not needed as these can be downloaded), a quick start manual and a shameless article/review of the Alnitak Flip-Flat in action. The Alnitak Flip-Flat itself is a very solid piece of equipment. ​A simple inspection of the Alnitak Flip-Flat reveals just how easy-to-setup this is. Its only connection is a single USB-B port. 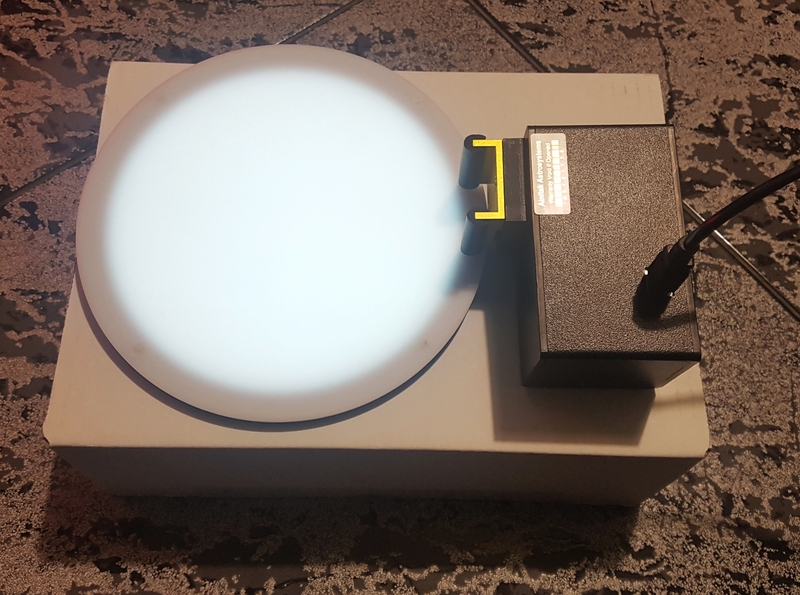 ​One of the most wonderful features of the Alnitak Flip-Flat is that this single USB connection provides both the power to the motor and flat field panel, and the data connection to the computer for controlling the Alnitak Flip-Flat through software. Physically mounting it to the telescope aperture is as easy as the SnapCap, and I expect as easy as any motorised telescope cover really. One of the included plastic cable ties can be threaded through the small slit in the Alnitak Flip-Flat​ and put around the telescope aperture. One could also use a metal Jubilee clip, of course, for an extra sense of security. ​​The software download provided on the Optec Alnitak Flip-Flat downloads page is for the software alone. 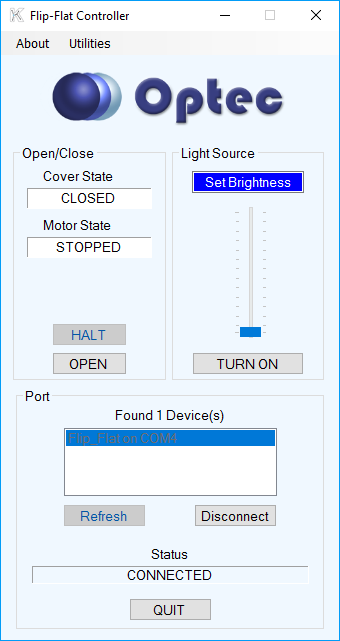 The drivers required for Windows to recognise the Alnitak Flip-Flat are the standard FTDI USB-Serial drivers, common in devices such as mount USB cables and autofocusers. Being by FTDI, the Alnitak Flip-Flat works flawlessly with Windows 8.1 and Windows 10 just as it does with Windows 7 (whereas the competing Prolific chips can cause problems with Windows 8.1 and Windows 10​). 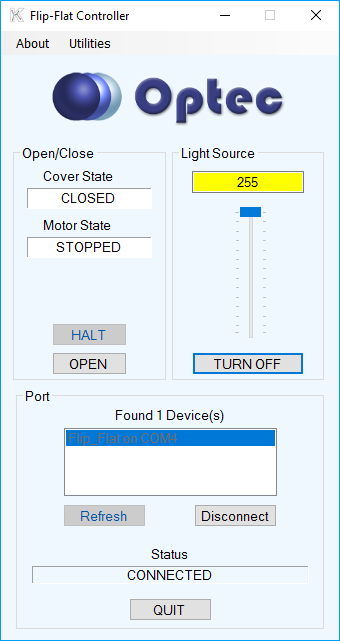 Once both the FTDI drivers and the Optec software are installed, the Alnitak Flip-Flat​ can be connected. 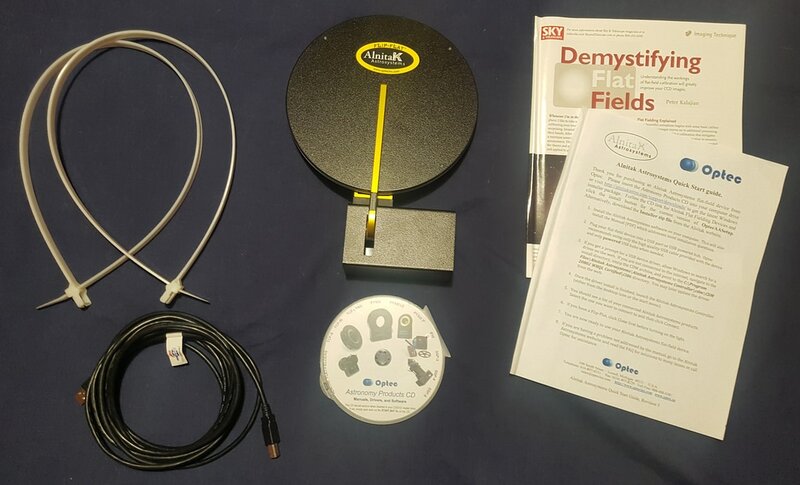 ​​The Alnitak Flip-Flat software is very much self-explanatory. The cover can be opened and closed as well as halted at any point during opening or closing. The flat field panel can be switched on and off, with a slider provided for defining the brightness level to set on it. This brightness control in itself is very much welcome over the Aurora Flat Field Panel, which had fixed brightness (which could only be altered by physically adding an ND filter inside it). The motor opens the cover fairly quickly and very smoothly to an approximately 100° angle from its closed position. ​​When the cover is closed, the flat field panel can be switched on. The brightness level can then be set with the slider, as desired. A specific value for brightness (minimum 0 and maximum 255​) can also be entered into the text box above the slider. 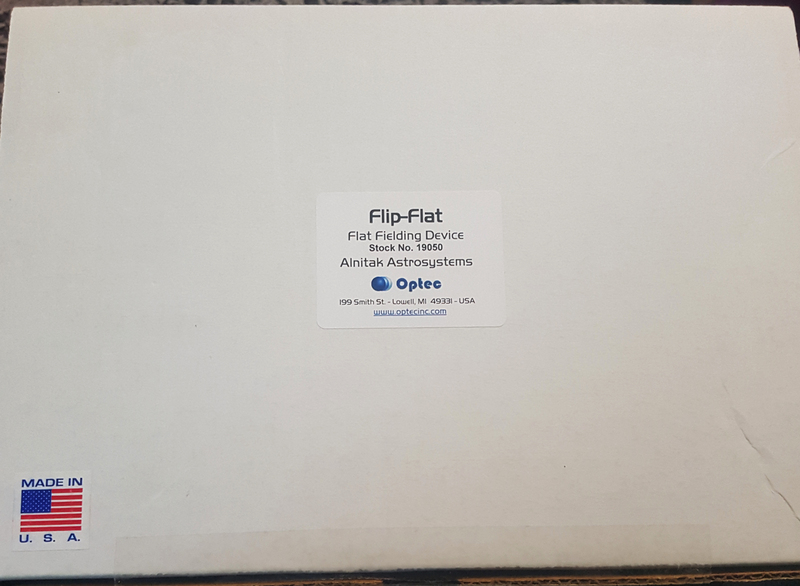 Though the Alnitak Flip-Flat can be controlled fully through Optec's own software (shown above), software such as Sequence Generator Pro can take control of it as a Flat Box​ device. 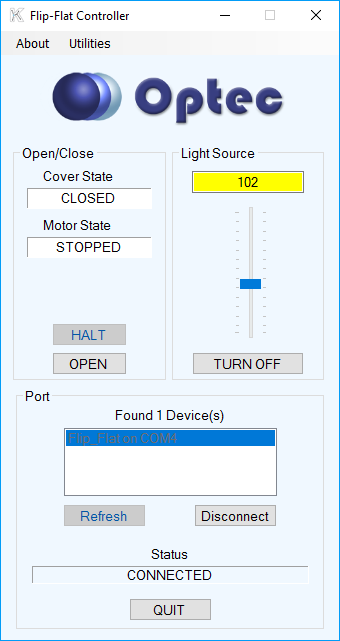 The Settings button is used to define the COM port used by the Alnitak Flip-Flat on your computer. 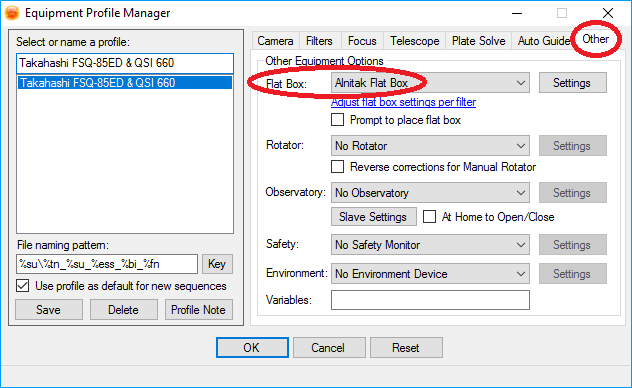 The link Adjust flat box settings per filter is used to define flat field panel settings on a per-filter basis. This allows you to automate the use of the flat field panel. 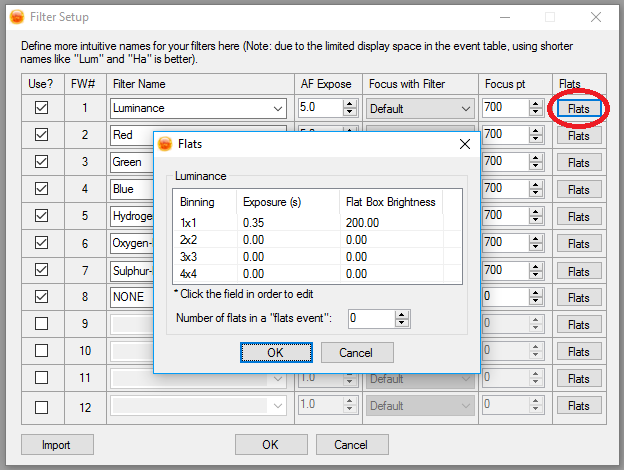 For example, if you know that with the Luminance filter, you need 0.35 seconds exposure time for 1x1 with the flat field panel set to a brightness level of 200, then this can be set up on the settings. The individual filter settings are certainly needed and Sequence Generator Pro provides these. Having added the Alnitak Flip-Flat as a Flat Box to Sequence Generator Pro, the software is able to open the cover prior to a sequence starting, and close it when a sequence run is complete (as part of its End of Sequence Options). No doubt other software besides Sequence Generator Pro can also interact with the Alnitak Flip-Flat in similar ways. ​Placing the Alnitak Flip-Flat on the telescope can be done with the included plastic cable ties, though a metal Jubilee clip can also be used, which is what I opted for. 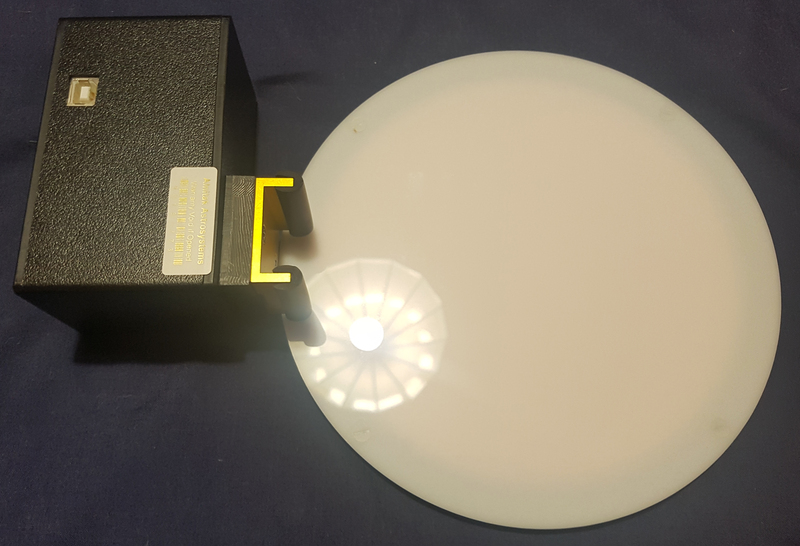 ​Given how the Alnitak Flip-Flat attaches to a telescope, the lower part of the aperture is placed along the dark rim of the integrated flat field panel. In some cases, this means that flat frames captured will see a slightly darkened edge, which is not ideal. The issue can be prevented by adding spacers in-between the bracket that takes the plastic cable tie (or metal Jubilee clip) and the motor box. This will no doubt require using longer screws. In my case, I used 6-32 1-1/4" screws (M4 thread) that are standard for computer watercooling radiators. Since these are pretty long and my aperture is pretty small compared to the size of the Alnitak Flip-Flat, I put in three thick nuts along each screw (the nuts need not be the same thread, so long as the screws fit through them as they act like washers in this case). 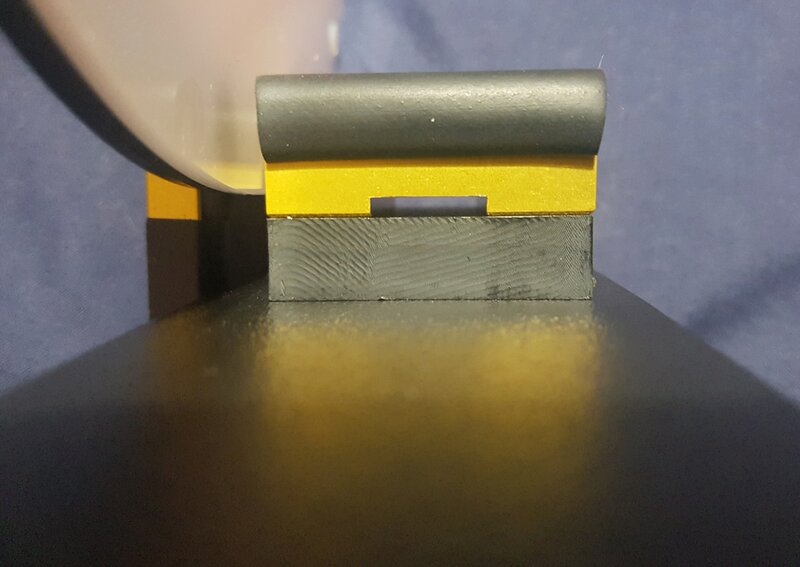 Putting these in as spacers pushed the telescope aperture further up towards the centre of the integrated flat field panel, preventing the camera sensor imaging the dark rim for flat frames. The integrated flat field panel of the Anitak Flip-Flat produces extremely uniform illumination with its thick, white diffuser. The brightness can be set to very bright levels (particularly useful for narrowband filters) and to very dim levels (good for filters such as Luminance). 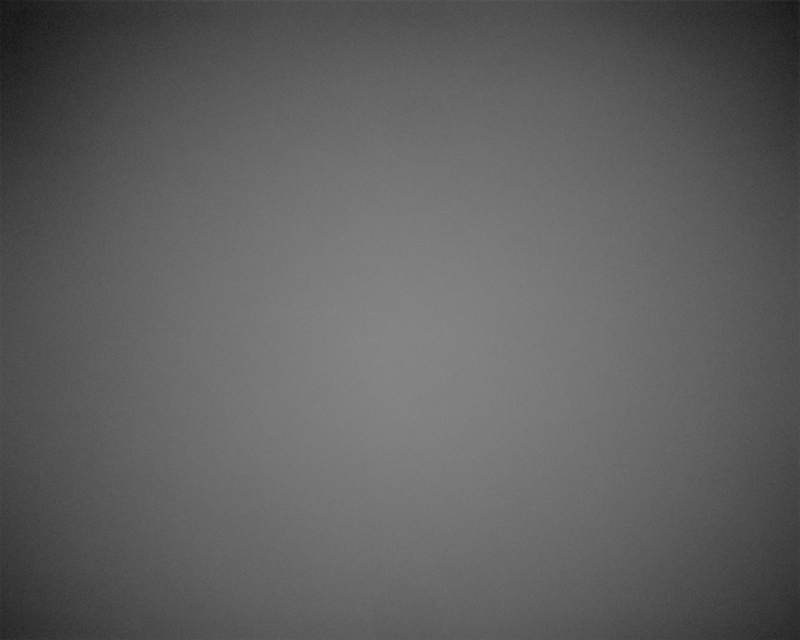 The following is a single raw flat frame done with the Luminance filter at 1x1 (no binning), with the flat field panel brightness set to level 36 (about 14% of maximum) and an exposure time of just 0.45 seconds. 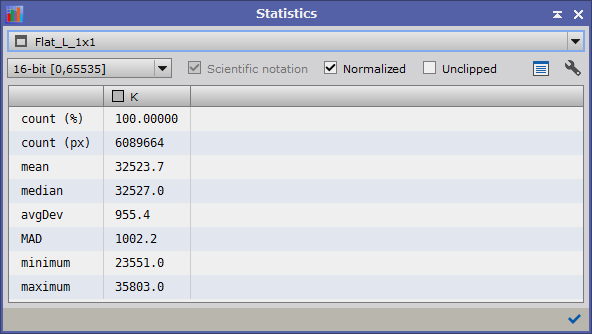 ​The above represents an ideal flat frame, with the Mean and Median pixel values at around 50% of maximum for the sensor, as shown below in the PixInsight Statistics​ process. Auto-stretching this flat frame in PixInsight shows the vignetting pattern of my optics more clearly, which also shows the quality of the flat frame produced. 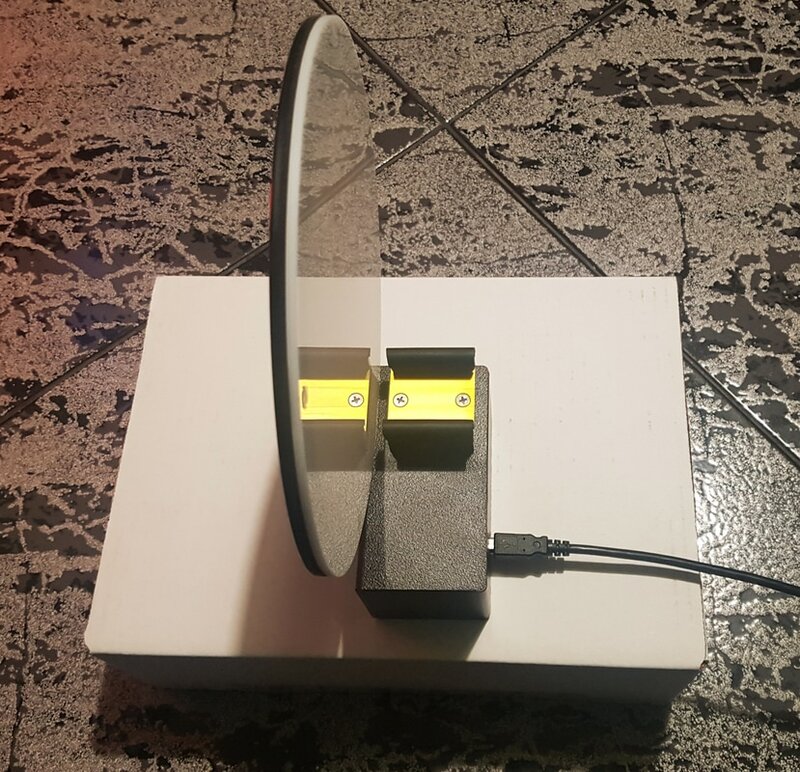 ​Though it is more than likely that a permanent setup for astrophotography does not require new flat frames often, simply being able to close the telescope cover and switch on the flat field panel with the mount switched off and all, is very useful. Having a remotely-controlled telescope cover in its own right is very advantageous in cases of permanent setups (especially remote ones), and so to simplify setups even more, having one with the flat field panel integrated is even better (barring the extra cost involved). 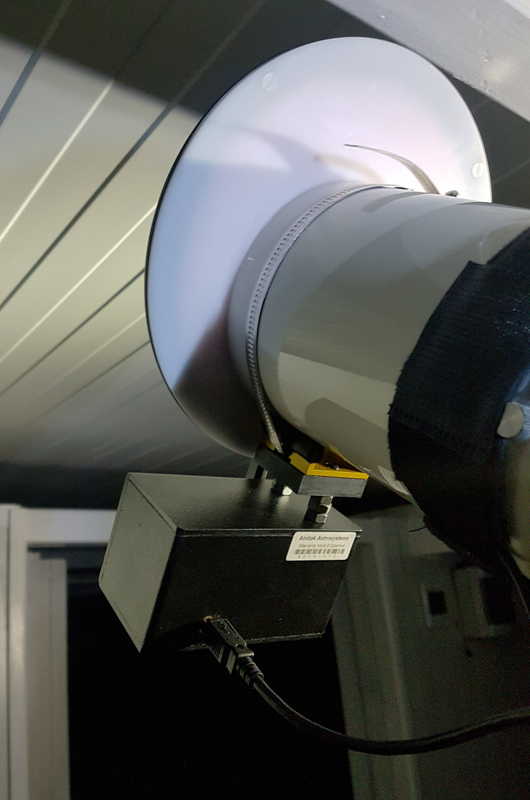 All things considered, particularly given the solid construction of the Alnitak Flip-Flat and the ease-of-use, it is a very highly recommended motorised telescope cover.